After being improved greatly, 's prefab houses is more advantageous in the following aspects. 4. The product is easy to move and install. 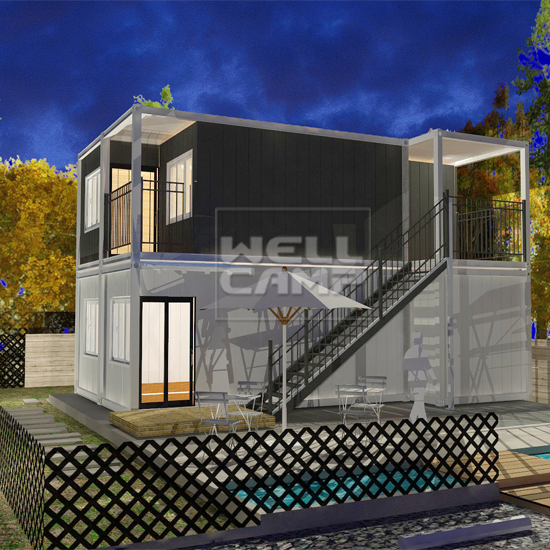 WELLCAMP, WELLCAMP prefab house, WELLCAMP container house keeps learning to better match the whole trend in the world. ◪This new manufactured home is made by the flat pack container house. It combined with 6 units container house,first floor 3 units and second floor 3 units container house. ◪Inside this 2 floor container home have the 3 bedrooms,2 public toilet,1 open kitchen, one living room,1 study room and 1 balcony. ◪Double glass Aluminum alloy windows. + Aluminum glass wall at front side+Steel door with handle&lock. ◪Standard electric+18mm MG flooring board. Combined with 6 units flat pack container house. The first floor have 1 bedroom & second floor 2 bedrooms. With completed roof and floor, 2 hours can installone house. This steel prefab container home is combined with the falt pack container houses, which is the new kind fast construction container house, 2 hours can install one house. This two floor manufactured container home, 1x40HQ can load 1 units. With the windows, door, flooring, steel stair, electric systerm and so on. 1.With completed roof and floor. 2 hours can install one container house. 2.Electric wires runs over ceilding,including DB, breaker, power inlet & lights.Socket & switch. 3.Can stack up to 3 floors! Can joint to be a bigger hall! Best option for office and apartment. 4.Fully welded top frame + truss & bottom frame+supports ensure product strength. 1. 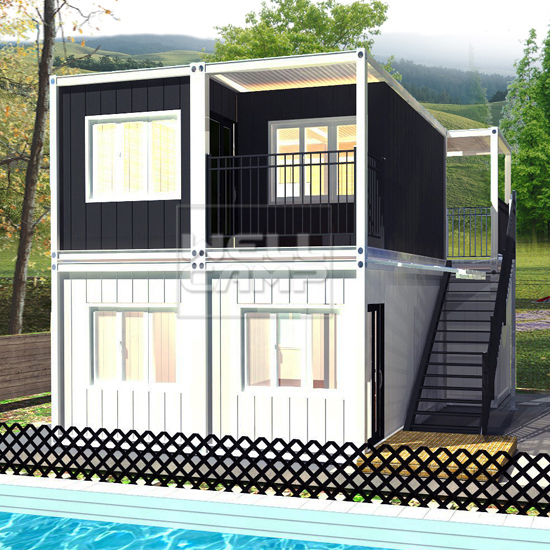 As society developed, WELLCAMP, WELLCAMP prefab house, WELLCAMP container house has been developing its own innovative ability to produce luxury living container villa suppliers. 2. Our clients greatly trust the offered container villa for its unmatched customized light steel villa. 3. FOSHAN WELLCAMP BUILDING MATERIALS CO., LTD actively encourages and creates an innovative atmosphere of cooperation. Contact us!